This indicator depends on the variety of ways which Winner Casino offers his clients to contact customer support and the speed with which it solves a problem, as also the overall customer experience. The reputation rating of Winner Casino is based on its popularity in online space - comments, user ratings on other sites, and social networking likes. Like free spins? Then you'll love Free Spins Tuesday at Winner Casino! Deposit on Tuesday and enjoy up to 60 FREE SPINS on some of our best slot games! You'll get 20 FREE SPINS each time you deposit €20 or more on Tuesdays. You can claim this promotion a maximum of three times each Tuesday, so that's 60 FREE SPINS up for grabs every week! 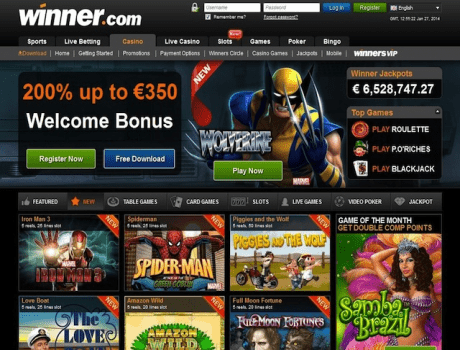 This bonus is not available to new customers making their first deposit at Winner Casino. To qualify for this offer customers must deposit a minimum of €20. Customers can receive no more than 60 free spins (3 bonuses) per Tuesday. There is a 50x wagering requirement on the winnings from the Free Spins Bonus before any winnings can be withdrawn. Bonuses are not redeemable and will be removed upon a withdrawal request. Bonuses are NOT available if a withdrawal transaction is already pending.